Striation defects in spin-coated thin films have been blamed on unfavorable capillary forces that occur due to solvent evaporation commonly experienced during coating deposition. Solvent evaporation during spinning causes predictable composition changes at the surface and these can either stabilize or de-stabilize the surface with respect to convective motions within the coating solution. The present work examines the surface tension changes while adding the most volatile component rather than removing it. This is then a “reverse drying” process, but it provides us with the slope of the surface tension change during normal coating drying. We have examined coating solutions for a case where a specific solvent addition has previously been shown to prevent the formation of striation defects. By measuring both the starting solution (one that produces bad striation defects) and the co-solvent-modified solution (that produces much flatter coatings), we are able to demonstrate the correlation between surface tension changes during spinning and the striation defect formation (or prevention). 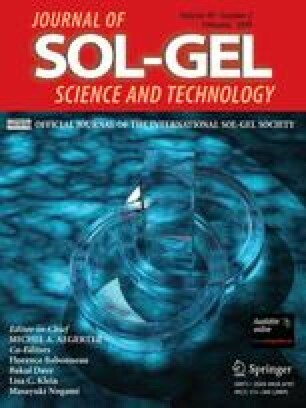 For the present case, an aluminum-titanate sol–gel recipe, the solvent that eliminated the striation defects is also responsible for a continuous, gradual, reduction in surface tension during the spin-on process, consistent with a model proposed earlier (D. P. Birnie, J Mater Res 16:1145–1154, 2001). The support of the National Science Foundation under grant DMR 98-02334 is very warmly appreciated.